WordPress Download Manager is the most powerful Files / Documents Management Plugin to manage, track and control file downloads from your WordPress website. 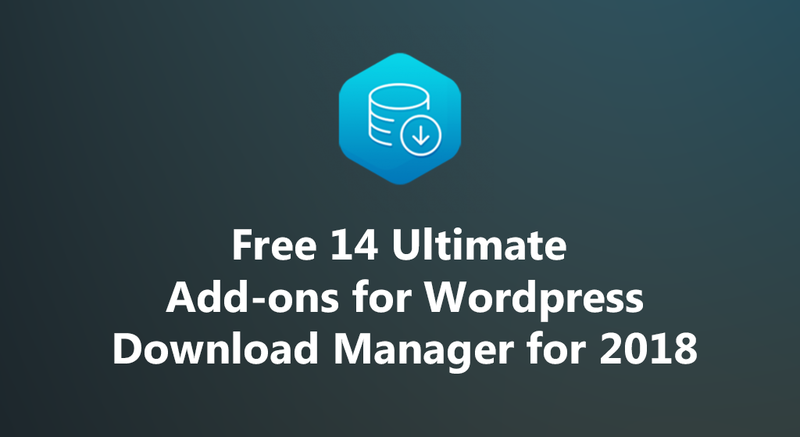 In this post, I have created an ultimate list of free add-ons for wordpress download manager to maintain easier way worpress activities. WordPress Digital Store Solution – Premium Package add-on adds pricing and licensing option with WordPress Download Manager Plugin. WordPress Digital Store Solution – Premium Package add-on helps you to setup prices for your digital products and sell it easily from your WordPress site. Moreover WordPress Digital Store Solution – Premium Package add-on provides simplest “Single Step” checkout process, which certainly will increase the ratio of sales than any other solution with a complex checkout process. So if you are selling digital products, but still not using Premium Package – WordPress Digital Store Solution, try this, you will be amazed, 100,000+ active users can’t be wrong. Box offers up to 10 GB free cloud storage and file sharing services that enables you to securely share and access files online. Now you can use the space to store your download manager file. Using this add-on you can explore files in Box storage and attach them with Download Manager. DropBox Explorer add-on will add a new button with your Download Manager to explore files in dropbox and attach with your download manager package. Google Drive Explorer Add-on helps you to connect with Google Drive, you can explore your Google drive files, upload files to Google drive and attach with your package. You can control your Google drive directly from you site admin panel, use free 15 GB space and save your bandwidth. Using WP Download Manager App you can check download stats, sales stats and some other wpdm admin option easily from your iPhone or iPad. Please install WPDM API add-on where you have installed WP Download Manager. The API add-on will enable remote access to your WP Download Manager data from this app securely. Using WordPress Download Manager App you can check download stats, sales stats and some other wpdm admin option easily from your android device. Please install WPDM API add-on where you have installed WordPress Download Manager Pro. The API add-on will enable remote access to your wpdm data from android app securely. You can use this add-on to handle remote data access request in your Download Manager Installation. Premium Package – WordPress Digital Store Solution is required with WPDM for this add-on. WPDM Page Templates add-on will help you to apply page type templates ( like full width page, page with left sidebar, … depending on your theme ) for wpdm pro package details page. WPDM – Image Button add-on will help you to replace the text (link label) in download link with an image button. Though, add-on packed with many excellent image buttons already, still there is an option to upload your own button images. WPDM Extended Short-codes add-on will give you a better experience in using WordPress Download Manager Pro. We will be adding new short-codes in every update. WP-Filebase Data Importer for WordPress Download Manager.